Since 1991, RB Construction has met the demands of our clients to ensure a safe and prompt remediation process that will meet your time deadlines. 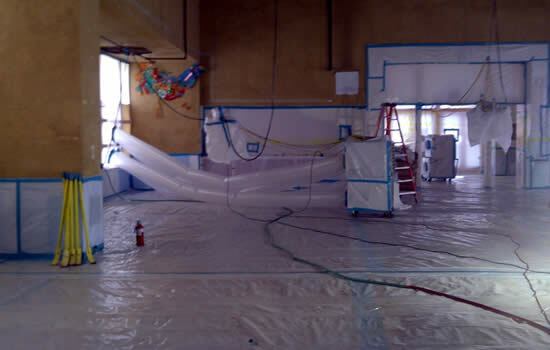 We offer the following services throughout central and northern California: asbestos abatement, mold remediation, lead-based paint abatement, hazardous material remediation, contaminated soil remediation and soft demolition. RB Construction can meet any demands or requests confidently no matter the magnitude of the project or timeline. We have a CSLB General B license with Asbestos and Hazmat Certifications as well as a C-21 Demolition license, C22 Asbestos License and DOSH Asbestos License. RB Construction is signatory to Laborer’s Union 67 in Oakland, if that is a requirement that needs to be met. We are also certified as a SBE (Small Business Enterprise) and MBE (Minority Business Enterprise) by the State of California and Cal Trans. We are fully bondable at a rate of 3%. We carry a standard insurance coverage of $10,000,000.00 for GL & Pollution. We perform work throughout Northern and central California and have offices in Fremont and Stockton, CA. Through our working relationships with many of the SF Bay Area's top GC's, R.B. Construction, Inc. has recently completed many projects for many of Silicon Valley's top companies, such as Google, Apple and Facebook. We have worked with Devcon, DPR, Level 10, Clark Construction, Truebeck, Webcor, Balfour Beatty, Kiewit and many other noteworthy GC's and have become one of the premiere abatement contractors in the SF Bay Area. RB Construction provides asbestos abatement, lead paint abatement, mold remediation, contaminated soil remediation, hazardous material remediation, soft demolition and underground storage tank removal. Most people know that asbestos is a dangerous material and needs to be remediated when remodeling or when you come across it in building retrofits. We are professionals at asbestos abatement and with many years of experience, RB Construction is the right company to call. Many homes and businesses find mold growing due to excess water and moisture. Not all mold is the same, so call the trained experts in mold remediation, JB Construction, to ensure that your mold is tested and remediated properly. Since 1978, lead-based paint was banned for use in homes and buildings. However, that leaves a lot of buildings that could have lead-based paint or stain, so it is important to have the right contractor remediate your lead-based paint. Hazardous material remediation implies that the materials are hazardous such as chemical spills, contaminated soils, lead-based paint, asbestos and more. The EPA guidelines require specific remediation procedures for hazardous materials and RB Construction is the licensed contractor to ensure your hazardous material is remediated properly and completely. Contaminated soil is caused by the presence of chemicals or other types of alteration in the soil. Typically soil contamination is caused by industrial activity, improper disposal of waste and agricultural chemicals. The contaminated soils can cause health problems, due to the vapors, direct contact or even secondary contamination of water supplies. RB Construction is the right contractor to ensure your contaminated soil is remediated properly and timely. 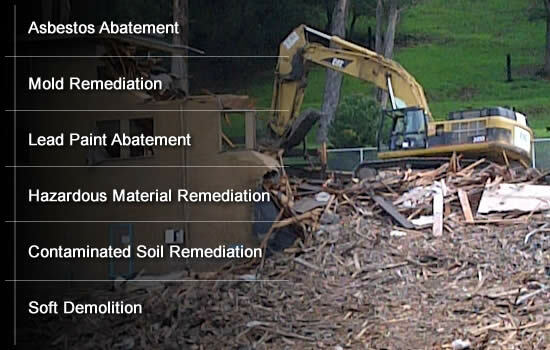 Soft demolition includes interior and exterior removal of buidings, partial or complete structure demolition, building strip-outs, concrete removal, dirt removal, both commercial and residential demolition. If you need a trusted contractor that provides top quality service in abatement or removal, call RB Construction at (510) 683-8780.